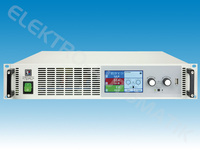 The microprocessor controlled laboratory power supplies of series EA-PSI 9000 2U offer a user-friendly, interactive handling concept, along with a remarkable set of standard features, which can facilitate operating them. Configuration of output parameters, supervision features and other settings, as well as the replaceable digital interface modules is smart and comfortable. The implemented supervision features for all output parameters can help to reduce test equipment and make it almost unnecessary to install external supervision hardware and software. The clear control panel with its two knobs, one pushbutton, two LEDs and the touch panel with colour TFT display for all important values and status enable the user to handle the device easily with a few touches of a finger. For the integration into semi-automatic and remotely controlled test and automation systems, the devices offer a set of interfaces (analog and digital) on their rear side.